Click here to see the full DISHS Sports Archive. Photo by Jack Scott Order prints of selected PBP photos. The golf team played in a division tournament at the par 37 Bucksport Country Club and came in second to George Stevens by 9 strokes. As has been the case all fall, Sam Grindle was medalist with a 41, Connor Morey had 44, Nick Eaton, 54, Drew Siebert, 56, Alec Eaton, 57, and Dave McManus, 60. As usual, the top four scores count. This tournament was only for practice and bragging rights. We went to the par 36 Searsport Pines course and easily beat Searsport, 186-214. Sam Grindle was medalist with a 36, Connor Morey, 43, Dave McManus, 54, and Alec Eaton, 54. The golf team has a busy week ahead, playing Sumner on Tuesday and a practice round Wednesday to prepare for the Penobscot Valley Conference Tournament on Thursday at the Jato Highlands course. Because we won all the individual matches in our division, we can bring five players to the PVC tournament and count the best four scores. This is also the qualifying round for the state team competition as well as the individual competition. 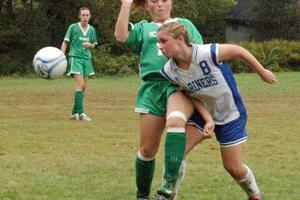 The girls soccer team beat Narraguagus, 2-1, in a comeback win. Trailing 1-0 going into the second half, Paige Rollins scored, assisted by Julie Hutchins, and then Julie Hutchins scored the winning goal with a penalty kick. This was another well-played game by both teams where most of the work was done in the midfield. There were no shots on goal statistics available, but Coach Dennis Rollins said there weren’t a lot of shots that were directly on goal for either team. The girls lost a tough game to Schenck, 3-2. We really outplayed Schenck, but a couple of penalty kicks late in the second half put us on our heels and we couldn’t get the equalizer. In the first half, Janelle Ciomei scored, assisted by Chelsea Brown, Schenck scored, and then Janelle Ciomei scored, assisted by Julie Hutchins. We had many opportunities in the second half, but Schenck converted a penalty kick to tie it and then chipped a goal over goalie Shiann Closson to take the lead with 15 minutes left. We pushed it, and maybe tried too hard, but couldn’t convert. 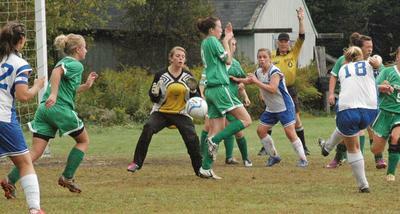 Shiann Closson stopped a penalty kick in that time and kept us close. Each goalie made five saves on 10 shots. The boys’ took a whooping from Bangor Christian, 10-1. Coach Bennett Morey said that Bangor Christian has a powerful team with several strong forwards and they play a very disciplined game. They returned most of last year’s state championship team plus a couple transfers to make them even stronger. They had too much offense for us to handle at this point, as we were outshot 57 to 5. Nathan Davis scored our only goal. The boys played a much improved game, losing to Schenck, 5-1. We had many good opportunities that either went wide or were saved by a hot goalie. We failed to convert a penalty kick as well. We definitely put in the effort and this game should have been closer in score. Hayden Ciomei and Hayden Torrey combined for 24 saves on 32 shots, while Schenck made 22 saves on our 23 shots. The shots on goal tell the tale of the game much more accurately than the score. The golf team is playing well as expected. The way we play at Jato in the PVC tournament this week will define our season as a team and as individuals. Coach Terry Siebert expects Sam Grindle and Connor Morey to qualify for the state tournament and hopes that one of the other players will do so as well. 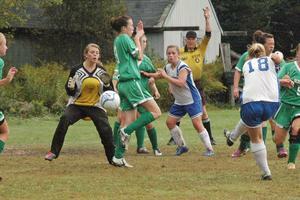 The girls soccer team is playing well with a 3-4 record. The two close games we have lost have kept us from gaining in the standings as the county teams still have played more games than us. We have a big game against George Stevens this week that we need to win to gain some ground. If we can stick with the fundamentals and remember our passing game, we will do well and should take them by surprise, avenging an earlier loss. The boys struggle to find that defining game to get our first win. The game against Schenck was very encouraging. We pretty much equaled their offensive pressure, but when we did get a hard shot at the goal, their goalie made great saves. We put in a strong effort for the entire game. Coach Morey is hoping we will make a similar effort against Searsport this week and come away with our first victory. 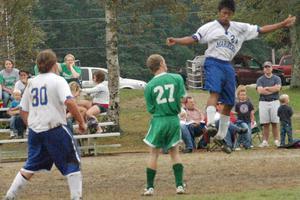 Kevin Melanio goes high for a header.